Corporate Saver - Stay longer for Less! Best Rate Guarantee offered on our official website. Please feel confident that you will get the best prices available right here when you book direct with the hotel. However if you find your room on-line at a lower price within 24 hours of making your booking with the same booking conditions, we will match it. Terms and Conditions apply. 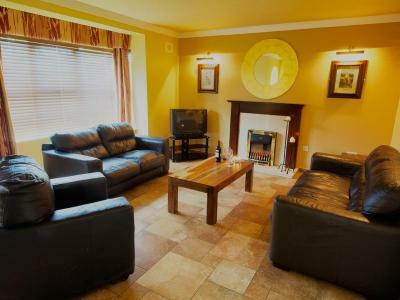 Please visit http://www.abbeycourt.ie/best-rate-guarantee.html for details. 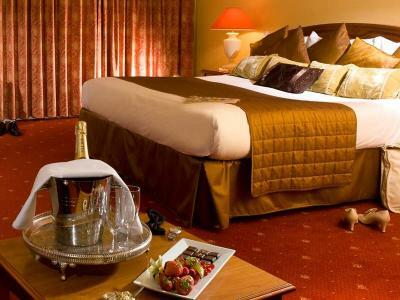 Our elegant and spacious double rooms boast style and comfort to ensure complete relaxation. 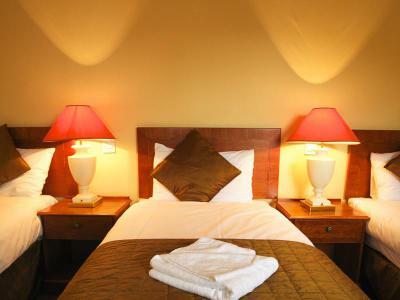 Ensuite rooms feature; complimentary WiFi, multi channel TV, tea/coffee making facilities and complimentary toiletries. Our elegant and spacious twin rooms boast style and comfort to ensure complete relaxation, which can accommodate up to 2 adults or 1 adult & 1 child. 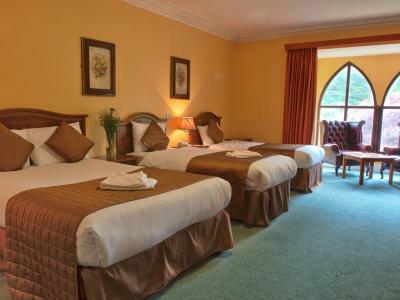 Our family friendly and spacious guest rooms comprise of 2 double beds and accommodate up to 2 adults and 2 children or 1 adult & 3 children perfectly! Cots and roll away beds are available on request. Our lodges are perfectly presented, located and equipped to ensure you have a truly enjoyable and memorable family holiday! Airy and bright, furnished to 4* standard, each have their own separate kitchen and living room, well presented bedrooms, downstairs bathroom, main bathroom and enclosed "wooden deck" back garden with wooden bench for eating and lounging outdoors... Lodge guests can enjoy the facilities of the Hotel including the Trinity Leisure Centre, complete with 20m Swimming pool, Spa pool, Steam and Sauna Rooms. Heat and electricity is charged at 10 euro per day per lodge. Cleaning - 1 Clean for the 5 Bedroom Lodge is 35 euro. These costs are additional and will be charged on departure. Check out time for the Lodges is 10am.